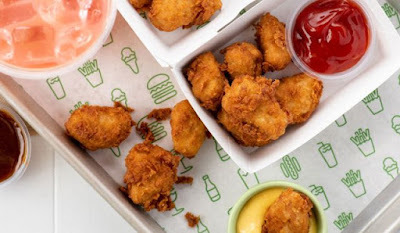 Shake Shack explores adding chicken nuggets to the menu with a test of new Chick'n Bites at their West Village flagship store in NYC. Chick'n Bites features hand-breaded, crispy-fried chicken breast pieces. They come in 6- and 10-piece orders for $4.39 and $6.39, respectively. A choice of BBQ or Honey Mustard sauce is included for dipping. The new chicken nuggets will also be made available at select New York City locations later this month. Sometime next month, they'll also be tested in other markets across the US.